Do you dream of a messenger app which can work without any data charges? In my view most of youth will answer positively about this question. Specially school going teens are highly excited about Jott messenger app. This app let users connect without any data connection on their smartphone. This app is available on both Android and iOS Operating systems. On signup screen simply enter your email ID to get an profile login on Jott messenger. On very next step it will ask for pin verification. 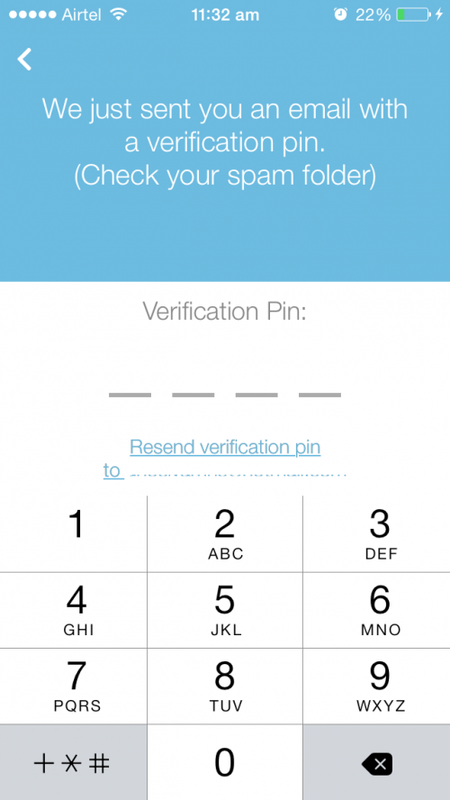 On entering correct pin you will be able to go next step of profile set up in this app. On this screen it will ask for image setting for your own Jott profile. It provides you two options to set an image. First option is to select an image from already taken pictures which this app can do via syncing your picture gallery on Smartphone. Second option is to take instant picture using the Smartphone camera. Personally I had choose taking instant pictures using it. This app will ask you if you are OK to get chat notifications on your Smartphone or not. Recently app creators & developers focused on keeping things clear to users. They want to let users know that certain things are going to happen while using the app. And they will ask permission of users. It also make Smartphone and app user feel the ownership of their privacy in these days. This app works on bluetooth and wifi radio waves to share & connect with other users of this app. 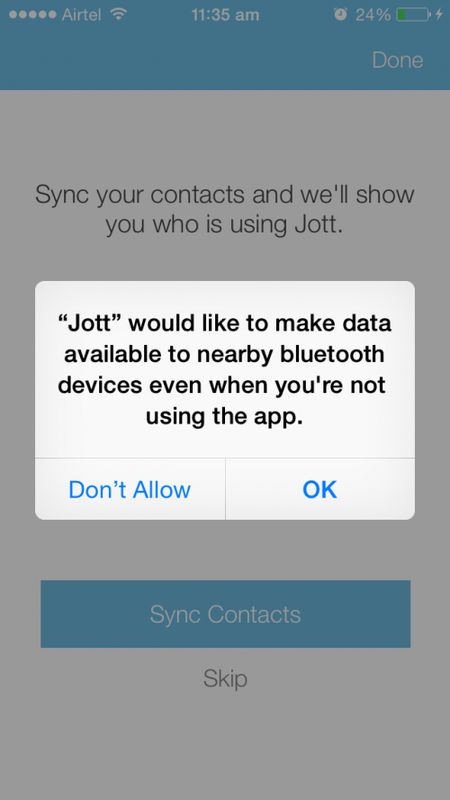 While first time you install the app it will ask you for bluetooth sharing permission. 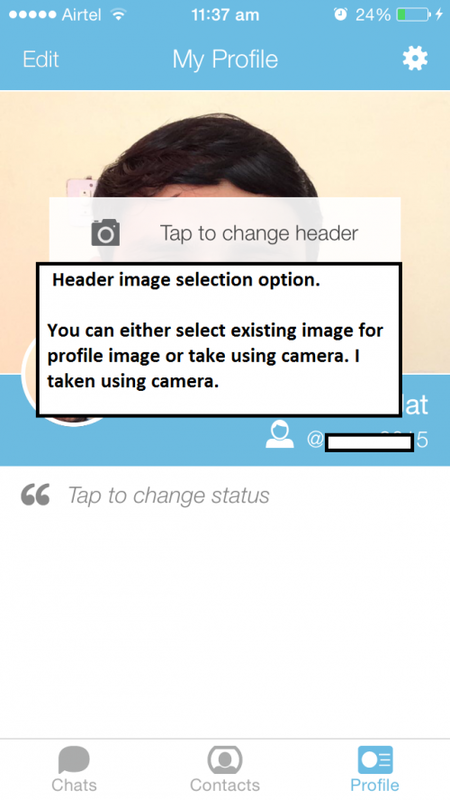 on this screen you will be able to see your profile header image, profile image, username and status update area. Below of app you will three navigational areas. From right hand side first one is profile which is shown in image above. 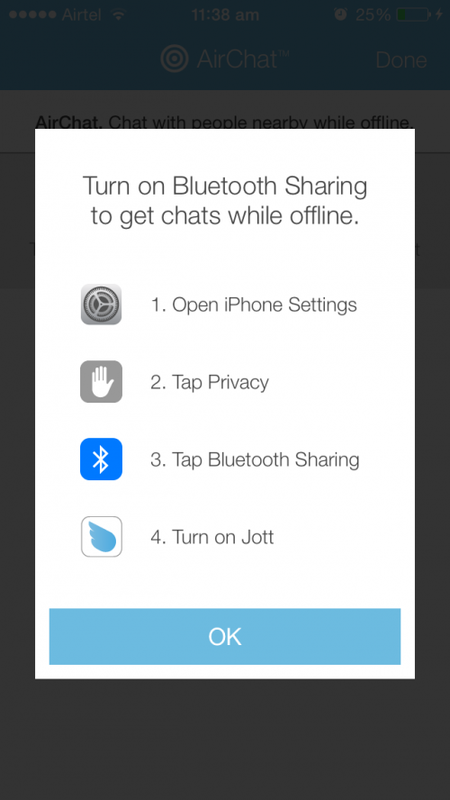 Second tab will show you all contacts you have with Jott messenger to start messaging. The last tab is for showing all active and past chats with other Jott users. 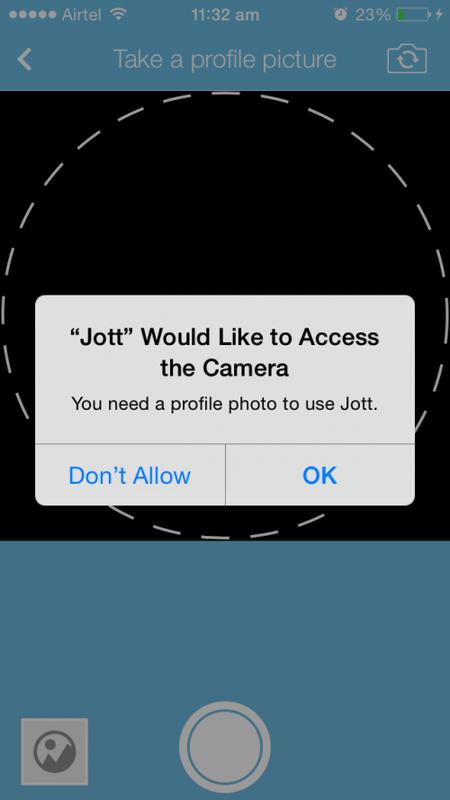 You can sync your contacts with Jott messenger to seek who is using Jott in your circle. Airchat is one of the best feature in this app. It lets you connect with all your Jott buddies when your Smartphone is in airplane mode. Thus you will not use any cellular or data network services to message. It will ask for Bluetooth On like above image shown steps. You just need to follow that. 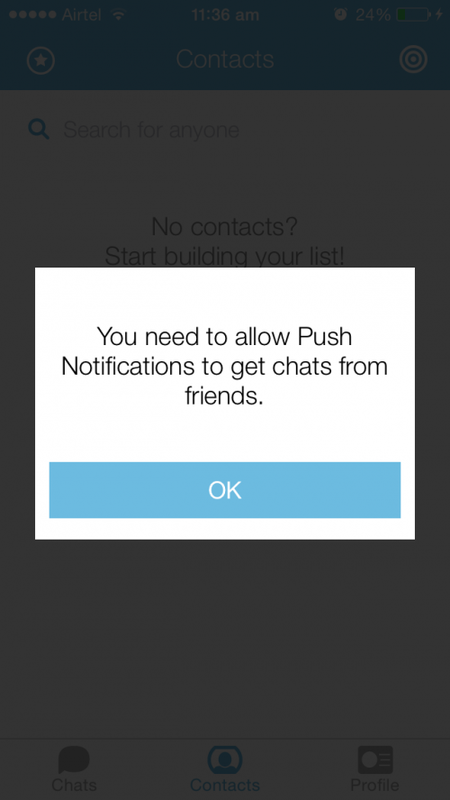 And You will be able to start messaging friends even when your Smartphone is in Airplane mode. This messenger app is specially useful for students who would like to chat with their buddies. 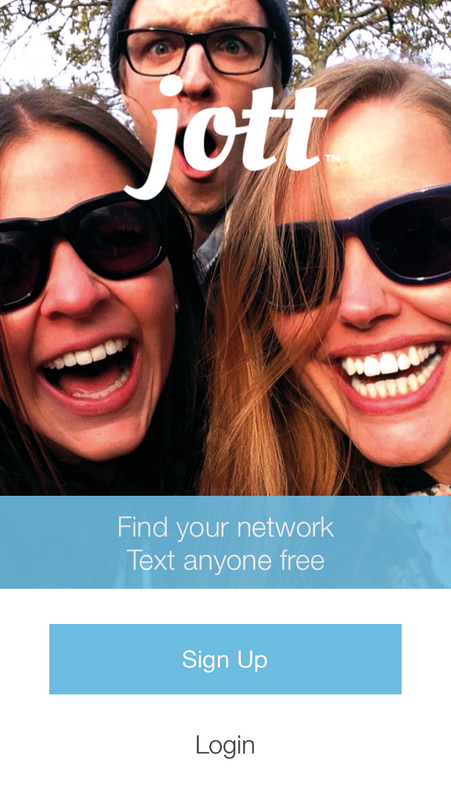 The only limitation in this app is that you can chat with a buddy in a 100ft radius only. Let me know below in comments if you have any question, suggestion or feedback about jott messenger app. Can I use it on a airplane?